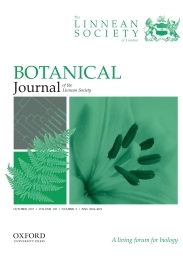 The Botanical Journal of the Linnean Society publishes original papers on systematic and evolutionary botany and comparative studies of both living and fossil plants. Review papers are also welcomed which integrate fields such as cytology, morphogenesis, palynology and phytochemistry into a taxonomic framework. The Journal will only publish new taxa in exceptional circumstances or as part of larger monographic or phylogenetic revisions. When most people think of illegal wildlife trade, the first images that spring to mind are likely to be African elephants killed for their ivory, rhino horns being smuggled for medicine, or huge seizures of pangolins. But there is another huge global wildlife trade that is often overlooked, despite it involving thousands of species that are often traded illegally and unsustainably. Orchids are perhaps best known for the over one billion mass-market pot plants traded internationally each year, but there is also a large-scale commercial trade of wild orchids for food, medicine and as ornamental plants. This is despite the fact that all species of orchids are listed by the Convention on the International Trade in Endangered Species of Wild Flora and Fauna (CITES), which regulates and monitors the commercial trade of wild plants and animals that may be threatened by exploitation. Whilst CITES discussions often focus on elephants and other charismatic mammals, orchids make up over 70% of all of the species listed by the Convention. 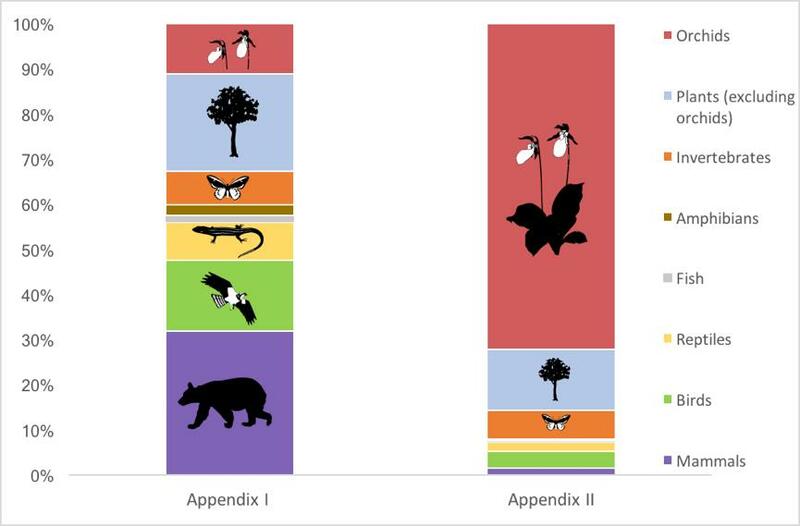 Composition of the CITES Appendices, showing the large proportion of orchids within the species listed by the Convention Vector images courtesy of the Integration and Application Network, University of Maryland Center for Environmental Science. Various different orchid species are used in traditional medicines in several countries and on a lot of different scales, including on a commercial level in some cases. For example, the stems and tubers of several species are used in Traditional Chinese Medicine, in products to improve general health condition as well as in medicines for specific problems. Similarly, South Asian Ayurvedic medicine uses at least 94 species of orchids in various medicinal preparations. In addition, orchids are used globally in various health products, including in bodybuilding supplements sold in Europe and the USA. Many people will have eaten orchids without realising, due to the countless products in international trade that contain the seeds of artificially propagated Vanilla orchids. However, this legal trade is only one example of orchids being used as ingredients in food and drink. One example is the trade in chikanda, a cake made from the ground tubers of terrestrial orchids and consumed in several countries in Central and East Africa. Another product made from the ground tubers of terrestrial species is salep, which is used as an ingredient in hot drinks and ice cream and consumed mainly in Turkey and neighbouring countries. 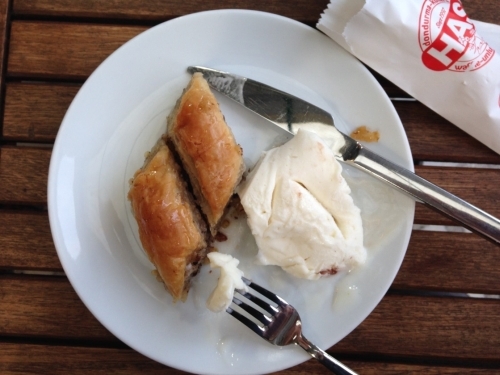 Ice cream made from orchids in Turkey. Photo credit: A Hinsley (Author). Orchids have been grown as ornamental plants for several thousand years, most commonly for their attractive flowers but also for their scent, patterned leaves or unusual growth habit. In Victorian Europe the ornamental trade was characterised by obsessive collectors suffering from orchidelirium (also known as orchid fever) that led them to pay huge sums for rare or unusual species. Whilst the majority of ornamental orchids traded internationally today are cut flowers and plants grown in greenhouses, there is still a large-scale commercial trade in wild, often illegally-collected plants. Harvesting for illegal trade is a particular problem in Southeast Asia, where species such as Canh’s slipper orchid (Paphiopedilum canhii) have been driven to extinction due to collection for international trade. Whilst diverse, all of these trades have been linked to over-harvesting, causing decline and loss of species from the wild. In addition, the nature of the trade presents significant challenges to conservationists trying to regulate and monitor the trade. These include the direct threat from many different types of illegal harvest and trade, rapidly shifting patterns of consumer and supplier behaviour, the huge number of orchid species in trade that make identification difficult, and the fact that very little is known about the ecology of traded species, or how threatened they are in the wild. Finally, whilst the illegal trade in animals may get a lot of attention from the public, from conservation organisations and from policy makers, plants are often not seen as a priority, resulting in little funding being devoted to research or action to address the unsustainable trade. To address these challenges, the authors of the paper recommend that the conservation community should focus on conducting further research on trade dynamics and the impacts of collection for trade; strengthening the legal trade of orchids whilst developing and adopting measures to reduce illegal trade; and raising the profile of orchid trade among policy makers, conservationists and the public. Featured image credit: Orchid by manfredrichter via Pixabay. Amy Hinsley has had an interest in the reasons why people choose to collect, trade and buy wildlife products since studying orchids as part of an undergraduate project. She studied orchids in Cambodia for her MSc dissertation, and the use of the internet by traders and buyers in the international orchid trade for her PhD. Amy's current research focuses on disentangling the legal and illegal markets for bear bile in China, which is a component of the Oxford Martin School Illegal Wildlife Trade Programme. This research is part of existing work established by the Chinese State Forestry Administration (SFA), the IUCN SSC Bear Specialist Group, and other partners, to address a 2012 IUCN World Conservation Congress Recommendation for research into bear bile markets in China. Public of booza New York is selling Salep, as are, apparently, a lot of middle eastern and Indian markets in the USA. The ice cream has gone viral in the west, it seems. Can you help me in trying to find the proper authority to contact about this?